Leave it to the Sundance sweetheart to give us hope about love while strumming the tune of “Love Stinks.” “Celeste and Jesse Forever” is the first foray into screenwriting by actress Rashida Jones (and writing partner Will McCormack). If Ms. Jones decided to quit her day job, I wouldn’t mind, as she’s found herself a great new talent. The opening of “Celeste and Jesse” almost had me groaning, as its opening looked like a slideshow made on Instagram, or a book called “What Hipsters in Love Do.” Luckily, the rest of “Celeste and Jesse” is neither of those things. Rather, “Celeste and Jesse” is something of a chameleon. 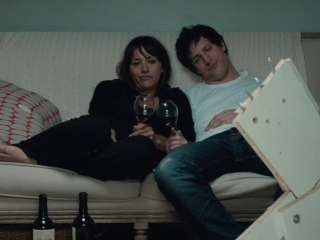 At first sight Celeste (Rashida Jones) and Jesse (Andy Samberg) seem like a perfectly happy, perfectly sane couple. However, what they are doing is not at all normal, as they are actually getting divorced. The first scene, in which the two of them playfully fight over a cigarette in the car is so well done that it totally through me off once the big revelation came around. This little secret is revealed at dinner with their friends Beth (Ari Graynor) and Tucker (Eric Christian Olsen), who are getting married soon. Beth and Tucker smooch at the table as Celeste and Jesse talk to each other in faux Russian accents, revealing exactly what kind of couple each of them are. It is the smooching couple that gets most annoyed, as Celeste and Jesse have yet to learn how to spend time apart. While the two are visibly comfortable being just friends, it is apparent as to why they couldn’t make it as a couple. Celeste is the hardworking one in the relationship. She’s a trend analyst (that’s a thing) working at a small company with her partner and gay best friend Scott (Elijah Wood, in a bit of perfect casting). She has a book coming out called “Shitegeist” (a title that I wish I had thought of), which sadly doesn’t make it past the back shelf on opening day. Piling on to her professional troubles, her company takes on the obnoxious teen popstar (Emma Roberts) who she dissed on TV. While this is a relationship story, it is truly about the development of Celeste. Jesse, meanwhile, is a slacker. As a grown man, he is not a slacker in the sense that he lays on the couch with a bowl of cereal while watching cartoons. He is more of a slacker in the sense of laying in bed all day with a bag of chips while sobbing to the Beijing Olympics. He’s a talented artist, but he can’t even finish a logo for Celeste on time. Nothing says ‘bad relationship’ like a faulty IKEA cabinet. After a while, you will start to realize that “Celeste and Jesse” is not a he said she said kind of story. As Jesse gets involved in another relationship, it becomes reliant on Jones. She shows a lot of strength both in handling awkward moments, of which there are plenty, as well as some of the sadder ones. There is a scene later on in which she gives a toast at a wedding. It works so well because it is played straight and the thematic element is played subtlety. It is exactly how the ending speech of “Crazy, Stupid, Love” could have turned out. “Celeste and Jesse” certainly has some poignant things to say, and it says them all well. In ways, “Celeste and Jesse” made me think of another Sundance entry from a few years back, “Paper Heart,” which explored whether or not a relationship can be accurately portrayed on film. Maybe it is hard to get the complete picture, but what “Celeste and Jesse” wants to show is that it’s actually a very good way to show post-breakup turmoil. To me, “Celeste and Jesse” felt very different from a lot of films coming out today, and some of its greater strengths proved to bring out some of the weaknesses of modern Hollywood. For example, none of the characters seem to serve simply as exposition delivering devices. Sure, many of them are there to tell the two leads how respectively crazy they are being at times, but those conversations always come out in the funniest and most delightful of ways. What I am trying to say is that every character deserved to be there. At times, I could have sworn that I felt characters going off script. At times, it feels like a more understandable version of Mumblecore. As much as I (and I’m sure most other writers) enjoy long monologues, it is nice to hear responses that sound like they were delivered on the spot. Just listen to how Jesse feels about his middle name being Mordecai. You may be able to guess his response, but that doesn’t make his answer any less funny in its honesty. Speaking of which, Samberg can definitely play something besides over-the-top, and I get the feeling that his Jesse is somewhat like his offstage persona. That’s a good and bad thing. “Celeste and Jesse” never demonizes any of its characters, but it is quite good at pointing out the flaws in those who seem flawless, and the good side in the people we often resent. While Celeste’s job is to predict future trends and know how every type of person behaves, she does not understand how to treat a boyfriend because she will just try and mold them into whatever she desires. Maybe the most interesting idea to come out of the entire film is that there is value in solitude, and a sense of maturity that arises when one realizes a time in their life in which they should be alone. Speaking of flaws, this film does not come without them. Despite a short 90 minute running time, “Celeste and Jesse” drags on a little bit at times. There aren’t necessarily any bad scenes, but there are many scenes that do not advance anything and linger just a little too long. It is also a sufferer of Multiple Ending Syndrome. Just as the film seems to have hit a logical end, after it has said everything that needs to be said, it tacks on another scene. The short finale is somewhat fitting, but what came before it was much more powerful. Some of have said that some of the film’s individual scenes overpower the whole. That statement is only half right if you look at this more as a breakup mosaic. Over 20 years ago, “When Harry Met Sally…” pondered whether or not a man and a woman could be just friends, and answered with a big, fat “no,” giving millions of guys in the friend zone hope. “Celeste and Jesse” explores this same topic, but with an answer that might make Chuck Klosterman happy. Celeste and Jesse’s struggle might show that it is possible for a man and a woman to love each other as friends. From there, I’ll just let “Celeste and Jesse Forever” speak for itself. This entry was posted in Andy Samberg, Celeste and Jesse Forever, Elijah Wood, Movie Review, Rashida Jones, When Harry Met Sally... on August 20, 2012 by ian0592.